With the midterm elections now over, there’s a good chance you’re in one of three camps: 1) those that are thrilled over a victory, 2) those feeling dispirited about a loss, or 3) those that have already moved on to thinking about Thanksgiving plans. But just because you’ve cast your vote, this doesn’t mean you have to cast aside your civic mindedness until November 2020. Maybe you start with a small array on your shed and build up from there, maybe you go whole hog and meet your entire household power demand from the start. Either way, you’ll be able to offset some of the cost with rebates and tax credits, generate a zero-risk return on your investment through utility bill savings, and join the many households across the country who are making the concept of local energy a reality. Just how much of an impact could you have in the world? Rooftop solar doesn’t simply reduce home energy costs—it ranks number 10 in Project Drawdown’s list of the 100 most substantive existing solutions to address global warming. 2. Buy an electric vehicle—or commit to having your next car be electric. Light-duty transportation, which includes cars, SUVs, and light trucks, accounts for 16 percent of U.S. carbon emissions. If you drive a good bit, the one-time act of switching your vehicle from gas or diesel to electric will make a huge impact in your everyday emissions. Not sure if there’s an EV model that fits your needs? This site will help you browse available models (and find applicable tax credits and rebates). We dare you to try and find someone who went electric and regretted it. 3. Adopt a plant-rich diet. Loading your plate with veggies and grains isn’t just good for your health, but has a huge impact on greenhouse gas emissions as well. It’s the number 4 solution in Project Drawdown's ranking, and for good reason: according to one study, adopting a vegetarian diet could reduce business-as-usual emissions as much as 63 percent. That’s a lot of impact for a transition that most us should probably be considering anyway, for our own mental and physical well-being. Think a couple of plane trips a year won’t make a difference? Get inspired by Peter Kalmus, a climate scientist who decided not to fly after calculating that the two international and six domestic flights he took in one year completely eclipsed his entire year’s worth of emissions from driving, eating, and using electricity. An added benefit of a "staycation"? You get to support your local economy and actually get to know your friends and neighbors. Especially around the year-end holidays, we tend to go into consumer overdrive. But might we all be happier if we cut back on the frenzied accumulation of “stuff” and focused instead on a few meaningful actions that really make a difference? For tips on having less stressful holidays with a lighter carbon emissions footprint—including cool ideas for giving “non-material” gifts—check out New Dream’s Simplify the Holidays campaign. Maybe you have the passion to work with your school district to get solar panels on local school roofs? Already, more than 5,500 K-12 schools across the country have taken the leap. 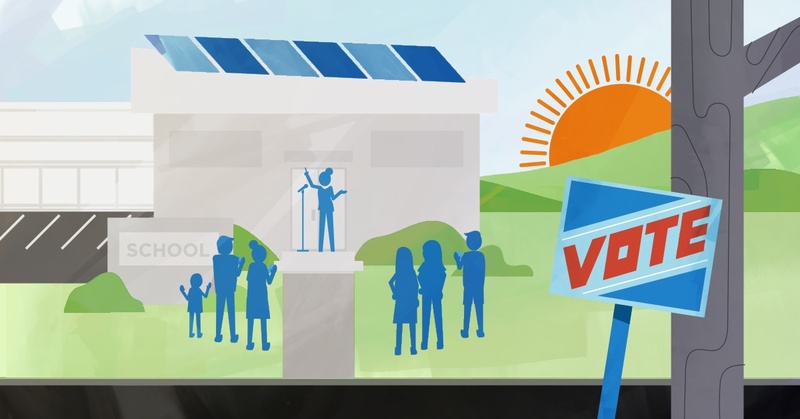 For inspiring examples and a toolkit for getting it done, check out Generation 180’s Solar Schools website and the experiences of Richmond Public Schools and Middlesex County in Virginia. 7. Start or support a “Ready for 100” campaign in your city. Across the country, people are getting together with friends and neighbors to promote a just transition to 100% clean, renewable energy. Join the Sierra Club’s national campaign to ask mayors, CEOs, pastors, principals, civic and community leaders, parents, and students to commit to solutions that help us achieve 100% clean, renewable energy across the U.S. by the year 2050. 8. Help someone in need. Find an opportunity to serve your community, such as volunteering at a local soup kitchen or donating to a shelter. Or, you could contribute to a campaign to support the education of girls and women around the world. Why? Educating girls and women is Drawdown’s number 6 solution for dramatically reducing emissions by 2050, because of its direct impact on family size and the global population. You don’t have to take all or even any of these steps, but you can definitely find a role to play that fits your life. Pick an action that you’re passionate about and that seems most doable for you, then take it from there. There are 720 days until the next big U.S. election. By intentionally making just a handful of choices that have a big impact, we can make every one of those days count.